Smilebox offers amazing greeting cards, scrapbooks, slideshows, birthday cards, and more Create amazing greeting cards, scrapbooks, slideshows, birthday cards, and more using your photos, videos, and music with Smilebox. Email, blog or print. It's fast, fun and free! Create free Easter eCards + photo memories! Add photos, video, and music. Get 14-days free! Create a free ecard using your personal photos, videos and music! How to save with coupon codes for Smilebox? Click one of our coupon/offer links and open smilebox.com offer page. Shop the Smilebox online store. 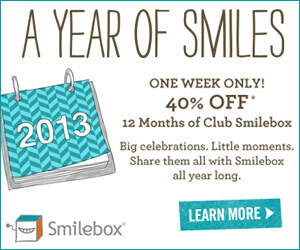 Enter the Smilebox coupon code during checkout (When available). If there is no code provided, simply follow the offer link and the discounts will be automatically applied. Found a coupon for smilebox.com?